A bankrupt lawyer and a greedy insurance adjuster concoct a personal injury scam involving a runaway grocery cart and recruit a half-wit golf course greenskeeper as their fall guy. But the plan goes horribly wrong, and as it spirals into a murderous fiasco, the grifters must deal with betrayals, shakedowns, bombs and mobsters to avoid prison… or worse, an early grave in a Southern California landfill. A bankrupt lawyer and a greedy insurance adjuster concoct a simple personal injury scam that goes violently wrong. It's a wild tale that's equal parts Elmore Leonard, John Grisham and Carl Hiaasen at their very best. TRUE GRIFT is a breezy page-turner that’s fun-filled and loaded with laughs from the jump. Donald Westlake fans will love this one. Joseph Wambaugh, bestselling author of "The Blue Knight," "The New Centurions," and "The Onion Field"
This caper novel is a fun, fast read, kind of like Elmore Leonard meets Donald Westlake, or the Golf Channel hosting a season of "Better Call Saul"
If crime paid, they say, it would attract smarter criminals. Jack Bunker's TRUE GRIFT is a rollicking misadventure that might deter anyone who's ever thought about making a quick buck off an insurance company. This first novel is perfect for fans of Elmore Leonard, Carl Hiaasen and Donald E. Westlake — which is to say, all smart readers. "True Grift" is a funny, fast-paced, ever-surprising hoot that belongs beside the finest schmoes-on-the-loose novels of Elmore Leonard. First-time author Jack Bunker displays an effortless, vivid writing style reminiscent of Elmore Leonard with the satirical spin of Carl Hiaasen. It’s hard to believe this is his first book. The dialogue is brisk, quick and witty, the situations outrageous but nonetheless believable, and the plotting air tight. The scam-gone-awry with murderous consequences may be hell for the shyster, but ‘True Grift’ is heaven for the readers. When an insurance claims manager and a personal injury lawyer who aren't quite as smart as they think they are come up with the perfect insurance scam, what could possibly go wrong? Plenty, as you'll find out in this hilarious novel by Jack Bunker. Fans of Dan Jenkins will love this one. Bill Crider, multiple Shamus & Anthony Award-nominated author of "Outrage at Blanco" and "Between the Living & The Dead"
Jack Bunker’s True Grift is a fast and funny read -- sharply written, imaginatively plotted, loaded with wit and local color. Peter Lefcourt, author of Purgatory Gardens. 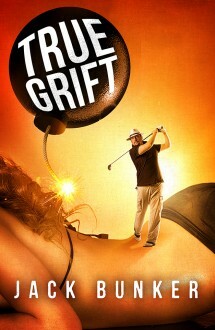 TRUE GRIFT – as the title indicates – is a comedic romp through a scam gone wrong. Along the way Bunker impressively avoids most of the pitfalls of first time authors. There are unmistakable echoes of Carl Hiaasen in this debut work, along with liberal doses of Elmore Leonard and Donald E. Westlake. Like these established masters Bunker knows how much fun it is to watch the best laid plans of desperate, dishonest people go wrong while taking the reader along for the ride. If TRUE GRIFT is any indication, Jack Bunker is on his way to a successful second career in crime fiction, and readers can look forward to more humorously entertaining stories from this new and impressively talented author. Jack Bunker's impressive debut novel stands out, even among releases by established pros, with t errific characters, fast-moving plot and a great twist at the end that I didn't see coming. Don’t be conned. TRUE GRIFT is the real deal, hilarious and action packed, full of unforgettable characters and a wildly entertaining story. Jack Bunker lets loose shakedowns, casinos, bookies, leeches, lawyers, and even a little golf----my kind of book. With this, his first novel, Jack Bunker proves himself to be a gifted and witty author who knows the law and how the "system" can be manipulated . A great read from first page to last -- you will enjoy every superbly crafted minute of it. Sol Wachtler, former Chief Judge of the State of New York, author of "After the Madness" and "Blood Brothers"
A fast and funny chronicle of a seemingly simple scheme to scam an insurance company...it's participants would be at home in any of Donald Westlake's Dortmunder novels.